As an author this got me thinking about my own weaknesses in my craft. For example, I tend to reuse a lot of the same descriptive words. As a matter of fact, I drove crazy one of my valiant test readers with my overuse of the word “scream” while he proofed my latest novel, Runaway. I had to laugh at myself (and his creative comments) and go through the manuscript searching for every time I used the word and insert a synonym. I have other weaknesses too, and rely on friends to alert me to them. Also, I have instituted practices to help catch them in other ways. But Close’ story has got me thinking about finding ways to take my weaknesses as an author and leverage them into strengths. Maybe overusing “scream” might be a hopeless cause, but what about other weaknesses I and other authors have? What if you were a horrible speller and had atrocious grammar? Maybe you could write your book as if it were the memoirs of your protagonist, who happens to have those same weaknesses? Suddenly, it’s a huge character trait running throughout everything you write. If you’ve ever read the (much different from the movie) novel Forrest Gump by Winston Groom you know how effective this style of writing can be. 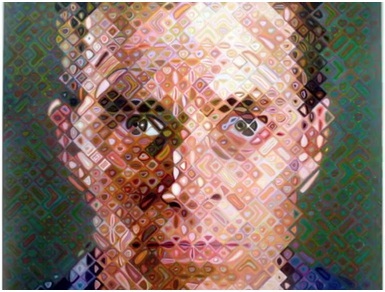 So, what do you think about Chuck Close? What weaknesses do you have, and how could you convert them into strengths? This entry was posted in Blogs and the Web, Life, Opinion, Writing and tagged author, Christian worldview, Chuck Close, strengths, turning weaknesses into strengths, weaknesses, writing, writing tips. Bookmark the permalink.